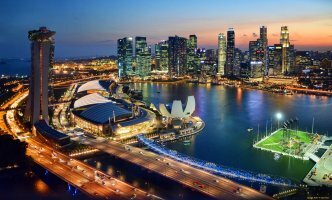 Singapore is dynamic and business oriented country, has a strong and sophisticated economy and the major regional hub for multinational businesses operating in Asia. 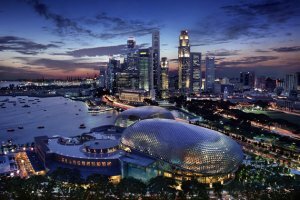 Regarded as a rapidly growing nation, Singapore is a key cornerstone to regional development and has a role to play in driving Asia's growth. Exports, particularly in electronics, chemicals, and services including the posture that Singapore is the regional hub for wealth management provide the main source of revenue for the economy, which allows it to purchase natural resources and raw goods which it lacks. Moreover, water is scarce in Singapore therefore water is defined as a precious resource in Singapore along with the scarcity of land to be treated with land fill of Pulau Semakau. Singapore has limited arable land meaning that Singapore has to rely on the agrotechnology park for agricultural production and consumption. Human resources is another vital issue for the health of the Singaporean economy. Singapore could thus be said to rely on an extended concept of intermediary trade to Entrepot trade, by purchasing raw goods and refining them for re-export, such as in the wafer fabrication industry and oil refining. Singapore also has a strategic port which makes it more competitive than many of its neighbors in carrying out such entrepot activities. Singapore's port infrastructure and skilled workforce, which is due to the success of the country's education policy in producing skilled workers, is also fundamental in this aspect as they provide easier access to markets for both importing and exporting, and also provide the skills needed to refine imports into exports. Singapore's top exports include electronic equipment, oil, machines, plastics, medical, technical equipment, gems, precious metals, pharmaceuticals, aircraft, spacecraft, books, newspapers, pictures. The top export partners of Singapore are Hong Kong, China, Indonesia, Malaysia and the United States. Singapore attracts a large amount of foreign investment as a result of its location, corruption-free environment, skilled workforce, low tax rates and advanced infrastructure. There are more than 7,000 multinational corporations from the United States, Japan, and Europe in Singapore. Singapore is considered a barometer of global economic health, especially within Asia, owing to its high dependence on external trade. Its foreign trade and capital flows is 407.9% of its GDP, making it the most trade dependent country in the world. It is the 14th largest exporter and the 15th largest importer in the world. The main imports of Singapore are refined petroleum, integrated circuits, crude petroleum, computers and gas turbines. Singapore's main import partners are China, Malaysia, the United States, Other Asia and South Korea. Singapore is a city state situated in Southeast Asia. It's neighbouring countries are Malaysia, and Indonesia's Riau Islands. Singapore is a global commerce, finance and transport hub. It is a member of the ASEAN, Asia-Pacific Economic Cooperation (APEC), East Asia Summit, World Trade Organization, World Customs Organization, International Trade Union Confederation and other international organizations. Singapore has adopted the 8-digit harmonised system (HS) code incorporating the ASEAN Harmonised Tariff Nomenclature to promote uniformity in the classification of goods and faciliate trade within ASEAN member countries. Rice imports require a license issued by EnterpriseOne, managed by SPRING Singapore. Specific plant and animal products require permits issued by the Singapore Agri-Food & Veterinary Authority (AVA). The importation of cosmetics, medicines and medical devices is regulated by the Health Sciences Authority. Electrical regulations are generally modeled on the British Standards specifications. Increasingly, IEC standards are adopted. 1. Obtain an IN Permit through TradeNet® before goods are imported into Singapore. 2. Pay the duty and/or Goods and Services Tax (GST) due at the prevailing rate at the time of importation. Foodstuffs (including beverages) and drugs are subject to and must comply with specific detailed labelling requirements. The labelling and claims for health supplements, cosmetics and medicines should comply with the guidelines set by the Health Sciences Authority. Packing should be sturdy and should guard against extreme heat and high humidity (frequently over 90 per cent) and possible brief periods of open storage. All wooden packaging and forest produce must be certified as being free from infestation by insects and fungi. Goods whose importation is restricted or dutiable, should not be packed in the same package or container as non-dutiable or unrestricted goods. Three copies are required and used for the opening of payment terms. To Order bills are acceptable and two copies are required. a signature of the proprietor, a partner or principal official of the manufacturing or supplying firm (the name of the person signing and their position in the firm must be stated).